Winter crafts can be a fun activity at home with your children when it may be too cold to play outside. Such crafts can also make the kids feel more a part of the holiday celebrations and get them into the holiday spirit. While appropriate crafts for children aged 2 to 3 years old should involve simple processes such as pasting and painting, ensure there's adult supervision with tasks like cutting. Create snowman magnets for the refrigerator. Provide the children with three circles of white craft foam sheets. Let an adult cut the circles to keep the craft safe for kids. Cut them into similar sizes, but each slightly larger than the next. Glue the circles in order from smallest to largest (with the smallest circle at the top) onto a wooden craft stick. Allow the children to glue small craft pompoms balls to create faces and buttons for the snowman. A mouth can be drawn on if you do not have very tiny pompoms. Stick a self-adhesive magnetic strip to the back of the craft stick. Purchase unfinished, wooden pre-cut snowflakes from your local craft supply store. Allow each child to paint the snowflakes with non-toxic craft paints. While waiting for the paint to dry completely, use the opportunity to explain how each snowflake is unique. Give each child a small sandwich bag filled with a small amount of glitter. Allow them to brush some glue onto the snowflakes with paintbrushes and place the snowflakes into the bags. Close the bags and allow the children to shake them up to distribute the glitter. Remove the glittery snowflakes from the bags. Create beautiful handmade snow globes with old baby food jars. Wash and dry the jars completely before starting the craft. Give your child a small figurine of a snowman, Santa or a reindeer and allow her to glue the figurine to the bottom of the jar's lid. Set the lid aside to dry and fill the jar with water, glitter and tiny Styrofoam balls (snow) which you can find at craft stores. Have an adult place a bead of hot glue around the inside rim of the lid and screw it back on the jar tightly. Allow your child to shake the jars and enjoy her new snow globes. Create a beautiful winter wreath from cut-outs of the child's hands. This wreath can be kept as a keepsake so you can compare the wreath to your child's growing hands. Trace your child's hand once on heavy paper or card stock and cut it out to make a hand template. Use the template to trace and cut out about 15 hands on green construction paper. Cut a large ring of heavy card stock and allow the child to glue the green hands all the way around the ring to create a wreath. 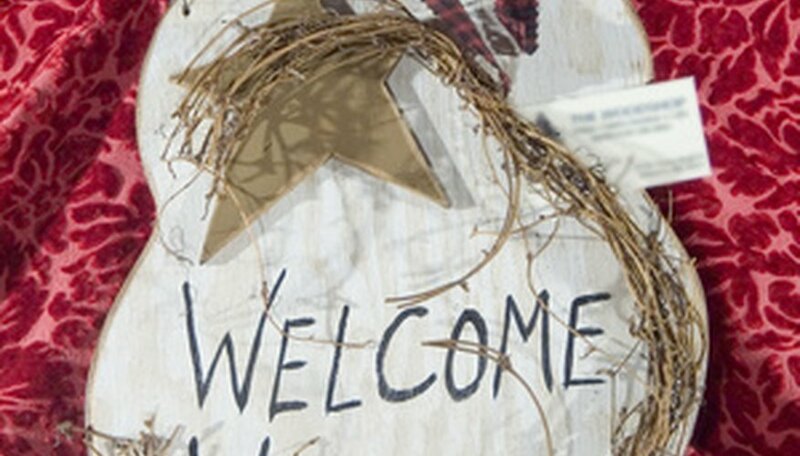 Provide him with glitter, glue, markers or paint to decorate the wreath. Mark the child's name and the date on the back of the wreath and hang it on the front door or refrigerator.